The highlighted Top Mobile App Development Companies are ranked based on GoodFirms’ proprietary research methodology and the current rankings are result of recently updated scores in the month of May, 2016 to provide the most up-to date data. 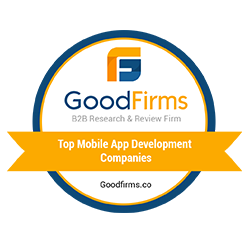 GoodFirms, a research & review firm, recently published its new round of research listing the Top 20 Mobile App Development Companies Worldwide. The research maps each firm based on their Quality, Ability, and Reliability to deliver a futuristic solution and judges them on their overall deliverability and focus. Rankings are based on GoodFirms core research methodology that measures quality, reliability, and ability of every company by conducting a critical evaluation of their industry experience, market presence, portfolio strength, online presence, sectors and categories served, industry recognition, technical and design capabilities, and client satisfaction rate. Client satisfaction rate is used to determine the review score which is calculated based on GoodFirms’ scientifically crafted review process wherein clients rate a company on multiple parameters during a one-on-one review call with GoodFirms; this multiplies overall authenticity of the process. Companies are ranked based on their overall score out of 60 score points (as measured based on above parameters), and their relative focus in Mobile App Development. The highlighted mobile app development companies have the proven skills & capabilities to deliver a futuristic mobile app wrapped with high quality and high efficiency. GoodFirms research aims to help service seekers identify companies that can meet their business requirements. The research results are persistently updated and the company thus encourages continuous participation from mobile app development firms with proven records in all its up-and-coming research. GoodFirms is a Washington, D.C. based research firm that aligns its efforts in identifying the most prominent and efficient mobile app development firms that deliver results to their clients. GoodFirms research is a confluence of new age consumer reference processes and conventional industry-wide review & rankings that help service seekers leap further and multiply their industry-wide value and credibility.